As previously reported, following the Leicestershire county council meeting held in September 2018- “An order was made under the provisions of Section 53 of the Wildlife and Countryside Act 1981 to add a Public Footpath to the Definitive Maps and Statements for Leicestershire and Northamptonshire”. Succeeding this, members of the public were given the opportunity to object to the proposed route. The application received 1 objection to the proposed map change, resulting in it now being passed on to the Secretary of State to make the final decision on whether or not the map change will take place. We have received an abundance of support throughout the 12 and a half years since Adam’s accident and we are eternally grateful. We are also pleased to have received tremendous support and backing from MP Neil O’Brien and Narinder Singh (Senior Parliamentary Researcher) who have both been in constant contact throughout this process and have been highly proactive with their ongoing support. We have also received full support from Market Harborough’s County councillor, Paul Bremner. We now are waiting to hear back from the Secretary of State with the final decision. We would like to take this opportunity to thank each and every one of you, not only for your support but also for your patience. We will continue to chase up and get a legacy in Adam’s memory. See you at the famous flapjack feed station! “An order is to be made under the provisions of Section 53 of the Wildlife and Countryside Act 1981 to add a Public Footpath to the Definitive Maps and Statements for Leicestershire and Northamptonshire”. This is the first major hurdle of our long term project to create AdamSmile, a safe walking and cycling route away from traffic between Lubenham and Market Harborough. We are delighted with this outcome and it is significant step towards achieving our ultimate goal. We would like to thank the charity trustees and all those that have continued to support us for the last 12 years. We are pleased to announce that an exciting new online lottery has been launched in the Harborough district to help local community groups and charities and AdamSmile has been chosen as one of the charities that you could support! The new online lottery has been launched by Harborough District Council, 60p from every £1 lottery ticket sold will go direct to local charities, voluntary organisations and other good causes. As well as having a chance to win great prizes, people who buy a lottery ticket online will be able to nominate which good cause they would like to support. Harborough District Community Lottery draw will take place every Saturday night with results posted on its website, Facebook and Twitter. Winners will be advised directly. All supporters will get the chance to win prizes of up to £25,000 – plus smaller prizes – for just £1 per week. Every ticket has a 1 in 50 chance of winning a prize every week. Race Harborough’s cycle event 2018 is back for another year. A fantastic event for all whether you are looking for a challenge or just for your kids to learn some cycling basics. Challenge yourself with either the 50K/100/K/100 mile route whilst the kids can top up their skills with Whizzkids cycle school. We would like to pass on our appreciation to Market Harborough’s Whitestuff Foundation for their support and generous donations. We are no longer their designated local charity but a massive thank you must go out for their continued support for the past 5 years. In total they have raised/donated £8488.32 for AdamSmile, a truly phenomenal amount! 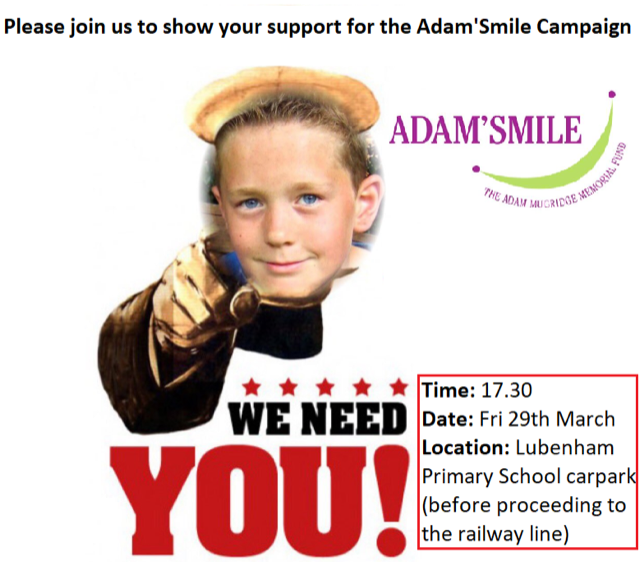 ‘AdamSmile is getting closer to being constructed.’ That is the hope of the AdamSmile trustees as they continue to press the Leicestershire County Council (LCC) on two fronts. Although it has been over 10 years since Adam died, the trustee’s determination to provide a safe walking and cycling route between Lubenham and Market Harborough is as strong as ever. They have recently had their hopes of progress raised through work with LCC in respect of formalising a public access route and in conjunction with the Market Harborough Transport Strategy consultation. The AdamSmile trustees have proposed that the old railway line be formally adopted on official maps as a footpath, with a view to upgrading it to a cycleway thereafter. This process, known as a Definitive Map Modification Order (DMMO), has involved getting statements from people who have walked the route over many years, and from land owners who would be affected. The DMMO application is now being considered by the legal team at LCC and the trustees are really hoping for a good result. The transport strategy consultation includes reference to improved walking and cycling routes and incorporates specific reference to the Lubenham / Harborough route. The consultative draft suggests a route alongside the existing road but the AdamSmile trustees are concerned that it does not appear to deal with the narrow part at the Lubenham end which is exactly where Adam died. The trustees have responded to LCC to raise their concerns and to highlight the railway line option. The charity has received over £130,000 in public donations towards its objective. These funds will make a real impact on the project once the legal processes are completed. The charity has a list of every donation and the trustees are hugely grateful to all those who have helped so far. Ten years have passed very quickly. But the object of the AdamSmile charity remains the same and the trustees continue to work to find a way of making it happen. If you have any questions or queries please do not hesitate to get in contact.